Lady Gaga‘s original fashion sense once again took center stage at the 2019 Grammy Awards … and we’re loving it. While walking the red carpet ahead of music’s biggest night on Sunday, Feb. 10, 2019, the Mother Monster looked as stunning as ever in a gorgeous, disco ball inspired dress, Billboard reports. Paired with her signature shoulder-length blonde locks and smokey eye makeup, Lady Gaga (real name is Stefani Germanotta) accessorized her instantly iconic look with a diamond Tiffany & Co. necklace. Meanwhile, her silver, strapless gown featured a high side-slit, ruffles, and sequins galore. Inside the award show itself, which was held at the Staples Center in Los Angeles, the “Bad Romance” hitmaker was nominated in five categories. In addition to winning Best Song Written for Visual Media and Best Pop Duo/Group for her “Shallow” duet from A Star Is Born, Lady Gaga scored Best Pop Solo Performance for “Joanne” from her latest album of the same name. Notably missing from the Grammys ceremony was Cooper himself, who attended the 2019 BAFTA Awards in London in lieu of the event (via Deadline). 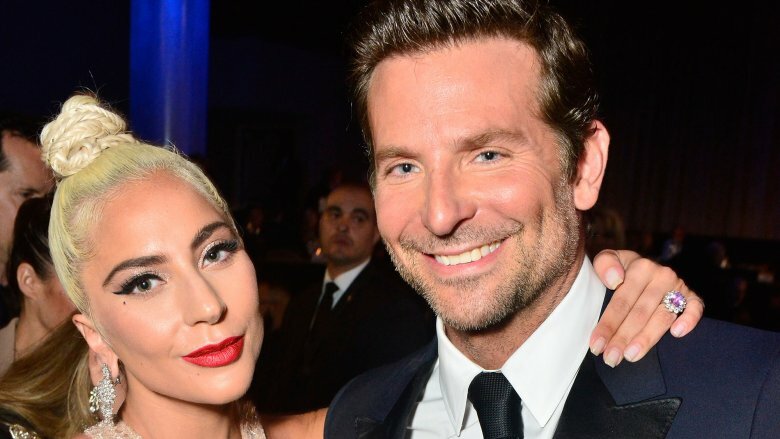 However, the duo, who are set to perform “Shallow” at the upcoming Academy Awards, also picked up the coveted Best Original Music prize across the pond this weekend. While accepting the award, the 44-year-old multi-talent said in part, “I got to fulfill a dream I never thought would happen. I share this with Lady Gaga tonight; the music was the heartbeat of this film” (via Us Weekly). Back in LA, Lady Gaga later took to the Grammys stage for the fifth year in a row to perform a rock rendition of “Shallow” alongside guitarist, frequent collaborator, and fellow nominee Mark Ronson. According to E! News, the performance was made complete with the pop star’s platform boots, a sparkling catsuit, and powerful belted-out vocals. 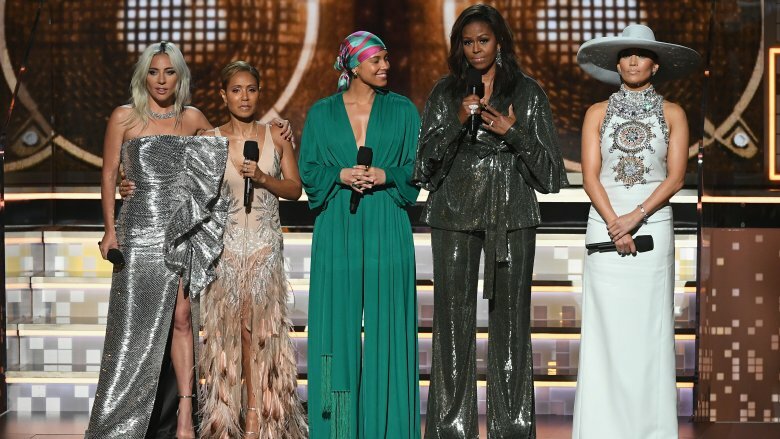 One of the most poignant moments of the Grammys, however, was one Lady Gaga shared alongside the evening’s host, singer-songwriter Alicia Keys, as well as Jennifer Lopez, Jada Pinkett Smith, and former First Lady Michelle Obama. After joining one another onstage at the top of the show, all five women took a moment to express what music means to them personally, according to E! News. For over a decade, Lady Gaga has proven those early naysayers wrong time and again — and her multiple achievements at the 61st Annual Grammy Awards alone are no exception.